The Dart Zone: Standard Rapidstrike, an illustrated guide. First of all, there is a lot of talk about motor swaps. The 130 motors that come with the RS aren't too shabby. They play well with battery voltages near 7.2 or 8.4V and deliver quite practical performance. Plus, compared to swaps, they are free. Be mindful of available space. If you use a larger pack in the stock battery box, use a smaller connector such as Deans. Lead free solder is recommended for higher heat resistance and mechanical strength for reliability. This is not electronics work. If you use leaded anywhere, do not use it on the motor or switch terminals. A note on batteries: You need an appropriately current-capable battery to make the RS perform and take advantage of the electrical upgrades we are doing here. I understand there may be a temptation to cut corners, but here that is a very bad idea. 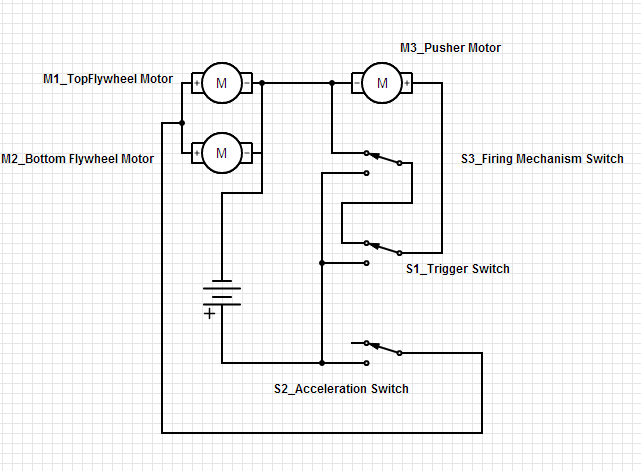 Here, we have more current-hungry motors than past flywheel guns (>15A transient at our chosen voltage), an additional load for the pusher motor, and we are shooting full auto (which necessitates, rather than simply recommends, enough torque to keep the flywheels up to speed during rapid fire, and torque requires current). The problems asociated with underperforming batteries are thus magnified even when using basic stock motors. What the NIC knows as "trustfires" or "ultrafires" (Li-ion, LiCo chemistry, 14500 or 18650 size cells) are absolutely unsuitable for most nerf applications they are often seen on (really, any nerf applications except low-load lights and electronics) as they cannot supply the necessary current. This type of cell is simply the wrong choice for a motor pack of any sort (and that is without going into the quality issues of the actual "____Fire" brands) since they are not designed for high discharge current and have much too high an internal resistance. Same goes for other types of batteries with inadequate current capability, such as alkalines, and some types of low-discharge-rate NiCd/NiMH and Li-ion/LiPo packs out of electronics, lights, etc. which are distinct from RC-type high current varieties. Bottom line: Those junk toy/flashlight-style battery solutions (you know the ones) have no business being in your nerf mod. Use an appropriate RC-type battery pack. This is not a personal opinion of mine, it is not a fancy upgrade, it is what basic design practice says this gun requires. Quit griping and making excuses and do it right. Remove the stock battery tray. We are going to discard that, since cell holders have way too much resistance to be used here and have no use on a mod. And separate the tray. Put it in the junk pile and set the endcap aside. Remove all receiver and barrel shroud screws and split the gun. Do not remove any screws from the stock as its disassembly is unnecessary. Cut this wire and put the left shell aside. Remove these lift-out parts from the right clamshell and put aside: front sight post, 3 rail accessory latches and springs, jam door, front and rear carry handle sight tubes, 2 sling loops, buttstock assembly (do not lose the pin); mag release group (3 parts); magwell liner, barrel, twist-lock fitting, battery box cover nut mount. Both the barrel shroud halves have these spring terminals. Pull those out and discard. Remove the magwell switch button and spring. This is the jam door switch. Do not remove it from the receiver. Leave it there to act as a detent and stop the door from rattling. If you don't have one of these switches or a substitute device, you will have a loose jam door. Unscrew the wire cover in the magwell. And the flywheel cage. BTW, all fasteners in the RS are the same diameter and thread. There are only 3 different lengths. One of those is a one-off, which goes in the front sight base. That just about narrows it down, huh? Don't waste time sorting screws. Remove magwell switch and PCB. Lift out fire control group. Get rid of all stock wiring. Again, this wire is incredibly undersized garbage. You don't want any of it in your mod. 3 self-contained mechanical modules in a RS. Flywheel cage, fire control group (FCG) and pusher box. This un-etched "shield" PCB needs to go. ...revealing a PCB used to wire the flywheel motors. There are 4 axial inductors, a PTC thermistor and some suppression passives on that. And a lot of parasitic resistance. But don't rip it out with abandon, it's soldered to the motor terminals. Those are thin sheet copper. Very thin. You break one of those, you are swappin'. Remove motor hold-downs. Also, cut off that round orange plastic (heat-staked) in the center of the PCB to allow removal. And unless you have a proper soldering station, go plug in your iron now, because you need to flow that solder to get this PCB off safely. While waiting for the iron to heat up, remove most of the FCG wiring. Remove this screw on the left side of the flywheel cage, remove the rubber sheet and discard. This device is intended to prevent locked-up flywheels from mag malfunctions that allow darts to fall forward. There are rumors about accuracy effects of this device, but in the end, it is the root cause of the Vigilante malfunction in which foam compression due excessive push force stops a dart from reaching the flywheels and causes a subsequent jam. Removing it is mandatory particularly for HvZ players and is key to seeing the RS's potential for remarkable reliability in actual use. Desolder stock inductors/leads from pusher motor. You do not need to do anything inside the pusher box. Also, take that PCB off the flywheel cage. Use flush cuts to chop off wire ends and solder blobs around edges of the two FCG switch PCBs. Do not remove the PCBs. Doing so removes support and insulation from the switch legs and makes wiring more difficult and reliability problems more likely. Do not be concerned to damage the PCB edges, lift the pad, etc. Do not cut or damage the 6 switch terminals - everything else is fair game to be leveled. Of course, if you have the soldering iron ready, you can also clean up the PCB nicely. Remove completely, grind down, or melt off any sharp edges or points on remaining solder away from the switch terminals to avoid punctured insulation on nearby wiring. Remove 2 screws holding the FCG halves together. Put aside the trigger and spring. Remove the spring from the flywheel switch button and dump in the now growing spare hardware pile. Remove these 3 parts. Discard the plastics, and chuck the springs in the hardware pile. Optional: Cut these diodes (now unconnected) on the cycle control PCB off and discard. These two 1N4001 are used in stock harness to implement the voltage dropped "pre-rev" when not feeding ammo. Stock flywheel switch. This "single-contact type" (as found in Barricades, Stryfe, etc.) ridiculously cheap Chinese switch is a very poor component. Poor reliability, not rated for our uses, and a source of resistance. I don't normally do that, but I was pressed for time and didn't feel like fighting with clips. Om nom. Some webs and bosses inside the FCG shell interfere with microswitch placement and have to be removed. Grind these surfaces flat and smooth. Switch button: Flatten the rear end and cut the tab on the top. This boss (Sharpied black) in the RS grip needs to be cut flush with the rectangular web surrounding it. The boss to the right may need to be ground down slightly. Trim NO and NC terminals slightly shorter on the switch to assist with fitment. Test fit in grip with the sling loop added (it is a constraint on positioning). Check for free travel and no rattle at rest. Mark/trace switch location with marker and grab the CA. Glue switch to the right FCG shell half. Before glue fully cures, test. Wick some more glue around edges of joint and wipe excess with a damp rag to speed cure. Reinstall trigger and left shell half and you have a completed FCG. The stock cycle control and trigger switches are perfectly fine as they are. True, a microswitch upgrade would be more durable, have a better trigger feel and be more precise and more tunable. The stock switches in these 2 locations are 2-pole models of this class of switch, though - the same low-cost switch used in the Stampede which rarely causes any trouble despite high currents. We will bridge those poles together just as in the Stampede, Vulcan, Swarmfire type applications, and we are only powering a single 130 (or 180, perhaps) pusher motor which has a very low load and average current draw. So it's safe, more or less. Next. These 4 bosses in the left half of the RS receiver need to be removed; the bottom two ground smooth and flush. The top two were formerly used to clamp down the FCG, but we will install screws in those existing holes/bosses and get rid of the stock janky methodology here. Less risk of a wire getting pinched and less annoyance during assembly. Note that we lost one receiver screw as a result of the microswitch install. No problem though. That's all for the teardown and prep, folks! Ready to assemble and wire. And here's the pile of refuse from all that. In this guide, we are building a "front-wired" RS. In "front wiring", the battery leads exit the rest of the harness at the flywheel cage area. The only difference is how the flywheel cage's negative connection is handled and where the battery leads go. To avoid excessive and unnecessary wire, we will bring the negative battery lead in from the battery box, strip 2 spots of insulation, and connect to the negative terminals of the flywheel motors to provide them a ground. No need for a separate flywheel negative lead that goes back and splices into that ground wire somewhere else. If you do not want to put your pack in the stock battery box and would like battery leads to exit toward the rear of the gun, omit the negative lead's continuation past the flywheel cage, re-route the positive battery lead to where you want your connector to go, add a negative battery lead alongside that, and splice said negative battery lead into the negative/ground wire back by the FCG. You will see what I mean. Lay out one end of a spool of wire with a few inches sticking out the end of the battery box (so you can plug the pack in easily when this is a battery lead) and the rest going back to the flywheel cage area. Use appropriate color for a negative battery lead/ground; here, brown. Note roughly where that wire meets the rear (negative) terminal of the lower flywheel motor. Strip insulation there using a knife and form a bend as shown. Find the sppropriate position of the next stripped spot and remove the insulation there as well. Hint, regarding wire: Do not use a commercial wire stripper on Teflon insulated wire unless it is designed for this insulation or is high-precision and very sharp. Use a knife with a whittling motion to strip Teflon wire and cleanup with flushcuts or scissors. Do not roll a blade on the wire to score insulation; this can nick the conductor and increase the risk of breakage, and should only be done (lightly) for silicone insulated wire which has much thicker and softer insulation. Do NOT cut the wire ANYWHERE yet; leave it attached to the coil/spool. This goes for all rearwards-directed pieces of wire here; you will cut these to length later after connecting to more hardware. Flux and tin (flow solder onto) the motor terminals. Tin the wire joint areas. Hint: Do not add additional flux beyond what is already in flux-core solder when tinning Teflon insulated (almost always silver plated) wire. This can cause wicking of solder resulting in hardening the wire and increased risk of breakage. The silver plated copper solders very easily and excessive flux is not required or beneficial. Solder the negative lead in place on both motors. Add a similar positive lead. This one will not continue on past the cage. Choose appropriate insulation color for switched flywheel power; here, white/red. The goal here is not to look good. Once again, I was pressed for time. If you go to the trouble of using 2 separate pieces of wire between terminals, you can get a cleaner install, but this method avoids splices. Fish a positive battery lead into the bundle (here white). This connects to nothing in the cage area. Set it at the same length as the negative battery lead end. Install the cage into the receiver, being careful not to pinch wires. You should now have 3 wires directed rearwards and 2 battery leads directed forwards to the battery box. Add pusher motor leads. Keep them flat to the case as shown! Z-bend the ends if necessary. Install pusher box and FCG. If anything interferes with pusher wiring, trim; do not damage motor terminals attempting to force in wire against obstructions. Install 2 screws to hold down FCG in 2 remaining counterbored holes. One shown with screwdriver, other at rear. Here's where you're at now: FCG in place, pusher box in place, and 5 loose wire ends. Flow some extra solder on the switch terminals. Try to bridge each pair as shown. Strip the negative wire (brown) in this area. Splice in one pusher lead (black). Ground also connects to the rear terminal of the cycle control switch. Hold up that free end of the negative wire to the terminal and cut to length. Strip and solder to both poles of switch as shown. Route flywheel power wire through FCG clips and solder to NO terminal of the flywheel switch, which is the nice new micro you just installed. Trim the rib off the bottom edge of the left FCG shell so wires can pass over this area without being squashed by the grip frame. Route remaining pusher lead alongside and down to center terminal of trigger switch. You know the drill already. Cut, strip and solder. 06-05-14 Edit: I am seeing some RS rewires on the internet where people soldered wiring to the more convenient outer traces on the switch PCBs that are electrically connected to where I solder the wires. Don't do that. I have you soldering directly on top of thw switch pins for a reason - the PCB trace is a total joke for handling high currents and shouldn't be in the circuit. Add a lead to the top terminal of trigger switch. Route that lead to the center terminal of cycle control switch. Splice a short piece of wire into the battery positive wire around this area. Route that front branch toward the cycle control switch and the (still uncut) length of wire down toward the trigger/flywheel switch area. And here it is again. Strip the positive wire without cutting it, Z-bend the wire as shown, tin the bare area, and solder to the bottom terminal of trigger switch, once again making sure you get a solid joint that connects to BOTH pins of the switch and has enough solder to be solid (inspect up close with a flashlight and tug on the wire a little to be sure). Send the wire on its way toward the flywheel switch. It is finally time to cut the positive wire to length. Terminate it on the common terminal of the flywheel switch. This is how your wiring should look. Install a battery connector on the battery leads. If you use a 6 cell Sub-C nickel pack (the extremely common 7.2V double stick RC pack), these ribs have to be gutted from the battery box. The endcap also has to be cleared of webbing inside and everything ground off clean and smooth. Plug in a battery pack and go play some stock class or HvZ. Absolutely beautifully done. This is a guide for the ages. I wish there was something like this when I first tore into my rapid strike. Regardless of timing very well done Toruk. Yeah, same here. Really good guide, wish I had it when I was getting into mine. so much fun, same here ill buy a new one and do this instead of what i did the first time ^^. Very well done Toruk. This has to be one of the most concise tutorials out there. ok this is definatly the guide of guides but one question. I have acces to all the materials you listed accept the switches. Is there a way this can still work with the stock switches and im not currently useing a lipo. This is defiantly the guide of guides. Very precise and to the point. Anyway Im in a pickle, i have all just about all the materials and basic skills for this mod..except for the switch replacements. I am also still using Trust fires how would i go about connecting the stock switches in this mod. The stock flywheel switch would be the only change. The wiring is fairly obvious; rather than connecting to the microswitch, you will connect to the stock switch, and you also omit the switch-related FCG mods and switch installation procedure. If you are using Trustfires, I would consider whether putting in the work to rewire is worth it. You may want to just lightly mod the stock harness (short out thermistors and remove pre-rev, per Rexar5) and wait to rewire until you can get some better batteries. If you plan for sure on upgrading soon, go ahead and rewire it. When I connected the battery pack to the front wires, the pusher motor was activated and running at full force without me pulling the main trigger. However the acceleration trigger worked fine, where did I go wrong? Was the pusher box installed? If it is not, the cycle control switch will remain up indefinitely, causing this symptom. The next likely issue is that when wiring the trigger switch, you switched the positions of the positive battery wire (white in my images) and the wire to the cycle control switch (black). Does pulling the trigger stop the pusher? Another possibility, you connected the negative pusher motor lead to battery positive rather than battery negative. Check your wiring step by step, and also be sure that no switch solder joints are bridged/shorted. After a wiring change or troubleshooting, always test with alkaline batteries or the like to verify that there are no short circuits or other hazards before connecting a pack. After this, I tried to resauter everything, then my motors went all 'splody lol. I'll buy a second one and try again. Thanks for your help! Thank you for your guide. About your Full-size microswitch with roller-lever, is there a brand or standard size spec i can reference when ordering online. Thank you for your comprehensive guide. About the Full-size microswitch with roller-lever, if there a brand or size spec i can to reference to when buying? Is there a Battery pack you'd Recommend? Also, how far does 80 feet per second shoot? Great Guide! hi guys i have a problem with my rapidstrike. when i turn my blaster on the dart pusher keeps moving and does not stop until i activate one of the locks . can someone help me? Fast question, if I want to do a simpler mod, can I only take out the two resistors on the locks and keep the original C batteries? What if I take out the two resistors and upgrade the battery as well but don't touch the fly wheel?Does it works? THANKS for who reply! I don't recommend you do that, just do the entire mod and instead of using an rc pack, try 8AA batteries. I did that and it works like a dream. You can try the c batteries but it isn't as good as the battery pack/more batteries. I was able to get a RS modded using these tips, with the recommended materials and power. All seems well except the dart pusher motor speed drops considerably when the fly wheels are engaged. With all the safe switches removed you can engage the pusher by depressing the trigger slightly until the pusher starts but the fly wheels are not engaged. When doing this, you can see the dart pusher at full speed (it's fast! ), but as soon as the fly wheels and the pusher are both engaged, the pusher slows to almost stock speed. I have the same results with 2 and 3 cell zippys (6.6 and 9.9v) and the behavior is the same (I have a 7.4V batt on the way). Do you have any suggestions on how I can troubleshoot this? The issue is current draw, I hooked up a 7.4v LiPo and this problem was solved. Hope this helps! If I have a switch rated at 1A 250V will it work as a replacement switch? Do I need to replace the removrd diodes to anything? As in, shoild I solder a connection between the traces or add wires instead? You do not. If you follow this guide, the diodes and the traces are irrelevant. Do you have a recommendation for a microswitch? I would love to make this mod but I am not sure what to use. Full size microswitches with the correct ratings and actuator type are readily available. Ebay often has cheap lots of V16 Omron clones with red and black cases. If you are stumped you can always use Digikey or the like and get genuine name brand parts. Omron V-214-1C6 is my rev button recommendation and is compatible with the instructions given here. A very nice mod I have not started yet, still figuring out the details. I am trying to make a Rapidstrike UZI, but with the LiPo battery that is recomended, where can I put it? Pistol configs have placed the battery above the pusher gearbox and used side mount battery boxes in the past. Remember to protect those lipos from impact with a hard case. The only pack that can be stuck on the side with velcro is an integral hardcase pack. Any idea why my darts have lost velocity after running only a few mags through. Checked battery voltage and loaded with new darts only to get the same result. I'm running a 7.4v 2s lipo battery in the exact config as illustrated. Thanks! i really wish the NC NO and C points on the stock micro switches were all labeled on the schematic. I might not be up to date on the standards but I'm at the point where I want to use slightly better switches for the control and rev but cant seem to get the wiring right. Am I crazy or the the S3_firing_mech_switch flipped in the diagram? In the stock rapidstrike I just got the switch was de-pressed while the pusher was extended. That shouldn't be. In any case, make sure the switch is wired to brake the motor when the bolt is retracted and power (or coast, for dead center) when the bolt is extended.